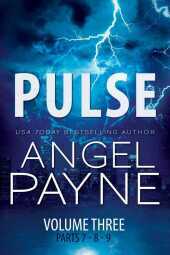 Coming soon from Angel Payne - A Superhero romantic saga unlike anything the world has ever known! While Reece Richards and Emmalina Crist play out their romance in the global public eye as superhero Bolt and his beautiful ladylove, they keep their biggest secret to themselves. Even if the lunatics of the Consortium have gone underground along with their leader, the cold-blooded Faline, Reece and Emma know the criminals could resurface at any time and threaten everything about the new life they're building together. But secrets take on new meanings when a night of glamour and celebration exposes old wounds-and new dangers. When Reece uncovers evidence that there may be a connection between his family and the Consortium's insane experiments, his quest for answers leads him, Emma, and the rest of Team Bolt to Paris. In the City of Light, truths are exposed and a trap is set, leading to a clash in the city's caverns that permanently alters everything for Reece and Emma-and reveals that no superpower on earth is more potent than the pulse of their true love.